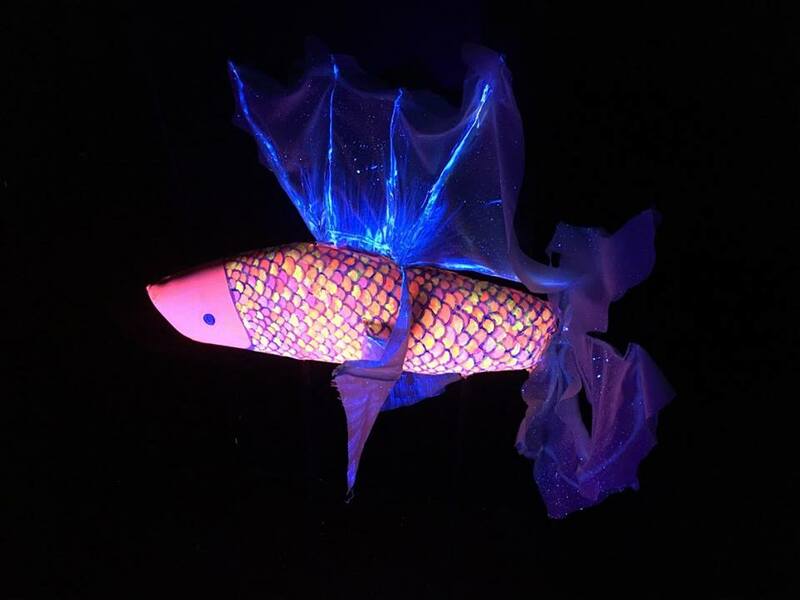 If you didn’t attend the Black Light Puppet Theatre performances this past weekend you missed out on a magical, joyful experience! For those following along with this series, I left off with the rehearsal process and how wonderful the performance was shaping up to be. 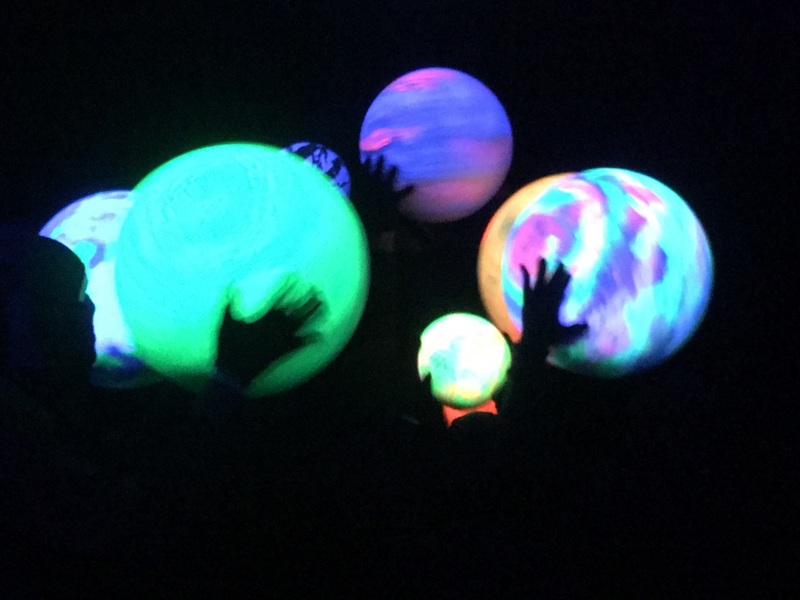 For new readers, start here to learn about our Black Light Puppet Theatre in partnership with Eggleston! To say I was blown out of the water by the final product would be an understatement. Each of the puppets were engaging to see under regular light, but under the black light everything came to life! I walked in on Friday and immediately was greeted by each participant, happy that I had returned (Can you imagine a world in which everyone greeted each other this way?!). They were elated that they were going to be stars that weekend, and their excitement was contagious. The VSC team and participants were dressed in all black so that you could only see their eyes. This helped to create the illusion that the puppets were the only thing on stage! It also gave the puppeteers a level of comfort that they may not have had in full light of the stage. When I went backstage before the performance, I saw some nerves, but their excitement was definitely outweighing their anxiety. There were many more puppets than the last time I had seen a rehearsal (50 puppets total!). Each participant gave me a hug before I went out to be an audience member. The opening sequence was really captivating! When the lights went down, the audience saw a bright moon with a face followed by many different planets. They whirled around the stage to music and seemed to orbit around the moon. As the song came to an end, the planets disappeared and the moon slowly exited behind them. Another piece of note had a beautiful poem that included a fox, a monkey, and a rabbit. All three came hopping, swinging, or walking onto stage to help the man in the moon, who was disguised as an old man. The vibrant colors of the puppets coupled with the participants’ manipulation truly brought the poem to life! My favorite song of the performance was called “De La.” As the song progressed we saw planets, sea creatures, birds, and animals. It was fun, upbeat, and they encouraged the audience to get up and dance! At the very end, the cast even brought out some puppets for the audience to manipulate. After the performance, everyone was so happy with how it went and excited to do it another two times that weekend. The weekend performances were full of family and friends of the participants as well as many Hampton Roads community members. It was encouraging for both the staff and participants to see Scott, John “Johnny Hollywood”, Anthony, Antonio, and Geraldine interact with their families both before and after the performance. I caught up with our team this week to see what their thoughts were after the fact, and there were a lot of the same words: amazing, humbling, exceeded expectations, awesome group of puppeteers, rewarding. They also talked about how great it was to learn about each individual and watch them grow and change over their weeks together. Marcus talked about how everyone who participated (staff included) got something out of this program. He enjoyed watching the participants learn a new way to express themselves. Michael will miss seeing the group. Jenny hopes that she will get to check back in with them soon to see how they grow. And Grace was grateful to have the opportunity to meet and work with such an amazing group of people! We are so excited to announce that we will be continuing this program in the fall with a new group from Eggleston. Our team is looking forward to working with this new group and helping them to learn a different way of expressing themselves. The seats for these performances filled very quickly, so keep your eyes peeled for reservations to open. Better yet, sign up for our email list so you’re the first to know when the next performance will be held! Newer PostIt's the Second Most Wonderful Time of the Year!